Another busy week, but then until the end of BBS (Baby Bird Season), the best it gets is a quiet riot! it looks like we're into a full second season of kestrels, with the harris' hawks not far behind. 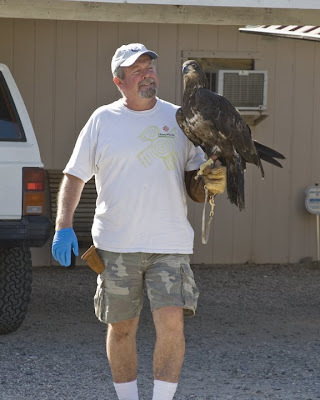 Another 1st year bald eagle is in training and we're beginning to release some of the orphan GHOs from earlier in the year. It all boils down to a never-ending stream of animals needing help - and getting it. 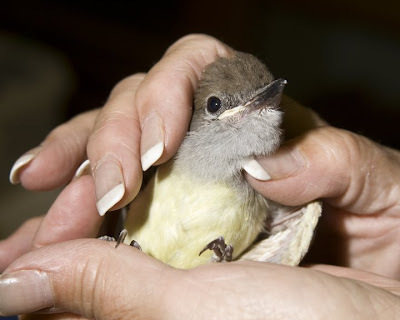 An ash-throated flycatcher puts in an appearance. 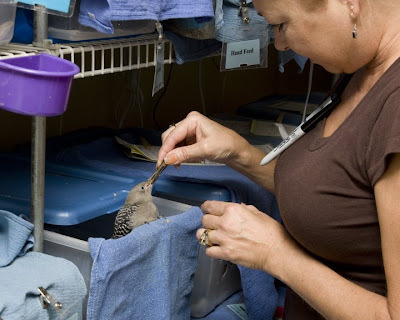 Bobbi feeds an orphan woodpecker. 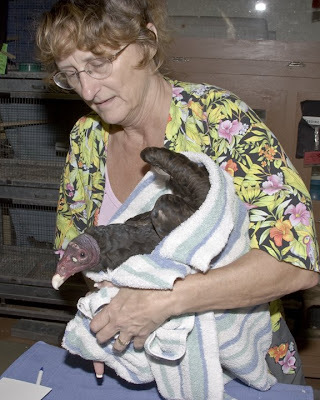 Arlene examines a young turkey vulture. Just watching the variety of birds that pass through the facility is an education in birding. Lots of times the species goes undetermined until some real plumage begins to grow in. You'd be surprised how many field guides we have in our library, and we are lucky to have some "power birders" in our ranks to help identify the various patients. Of course, not all of them are as arcane as the ash-throated flycatcher that arrived last week, most being more common like the woodpecker or the young turkey vulture which are more easily identified. A village of cooper's hawks. 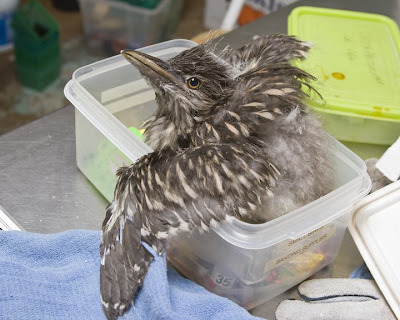 This fuzzy-rumped black-crowned night heron found a home in the banding tub. Then he joined his fellow BCNHs in another village of orphans. When the species get along together in larger numbers, it's always better to keep them in groups. This prevents improper imprinting on humans, and it saves time, space, and effort in raising a group of similar birds. 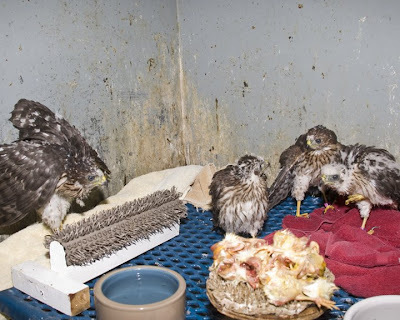 We currently have two "villages" of orphans, one populated with cooper's hawks, and the other (in the adjoining cage) filled with BCNHs. All are doing well and will soon be transferred to outside enclosures for environmental acclimation. 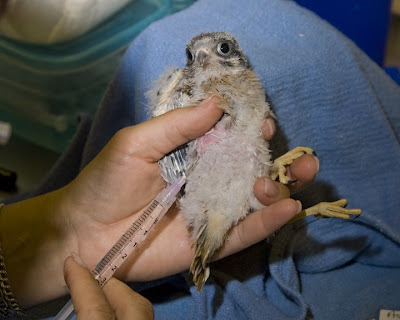 That's a big needle for a little bird! 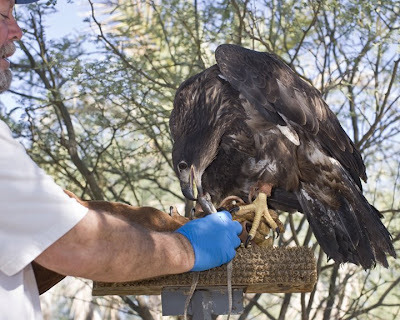 Yes, lots of Arizona birds will "double clutch" when the weather is conducive to such behavior. the arrival of several nestling kestrels belied the arrival of the second season for this species. 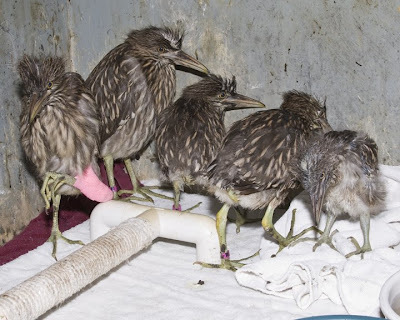 It's too bad the birds don't realize the burden this places on the environment and the rehab community! Still, nobody tells them, "No, I'm sorry, you were supposed to be born three months ago, so go away!" 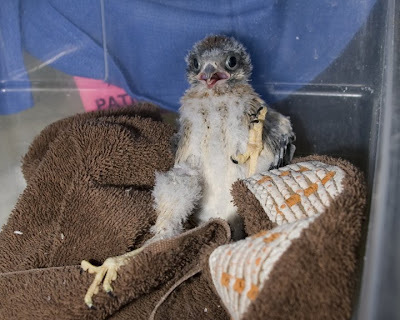 These cute little falcons get the same care that the earlier arrivals got, complete with fluids, emergent medical treatment, and caring foster parents. 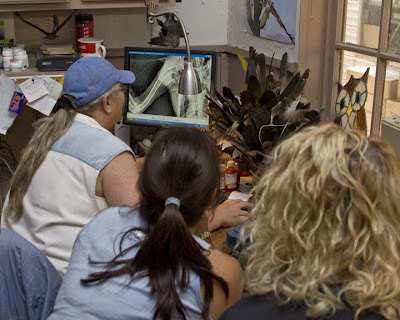 Dr.Orr, Jan, and Lesley examine the X-ray of the golden eagle. the golden eagle that came in a couple of weeks ago is still with us. She was taken for X-rays last week (see last week's update) and they were closely read by Dr.Orr this week. It appears there is some tendon damage and possibly a bone chip in her right wing. She is in the flight cage now and we're watching her closely to see what develops. The little bald eagle makes a new friend. Eating from Joe's hand on day 1! Speaking of eagles...one of the broken wings on the pre-fledgling bald eagle that arrived a few months ago didn't heal properly. He has therefore now been reluctantly declared "Injured - Non-releasable" and as such, his federal bands were removed and replaced with anklets and jesses. He is now going through the first stages of his career change from hunter to teacher. He seems to be a very fast learner and was standing on Joe's glove and eating from the hand on the first day. A long life for him as an ambassador to his species is in the making. 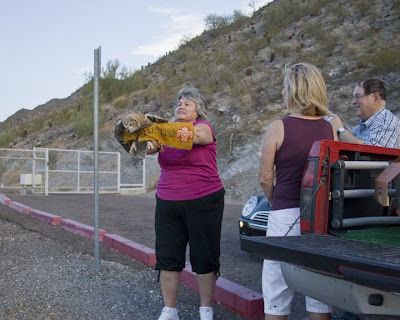 A lady of Native American descent prepares to release a GHO. 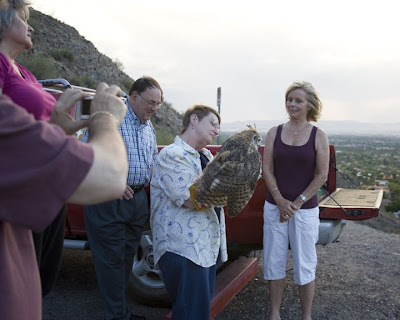 The owl flies free for the first time! Preparing for the second release. Two of our orphan GHOs were released last week. 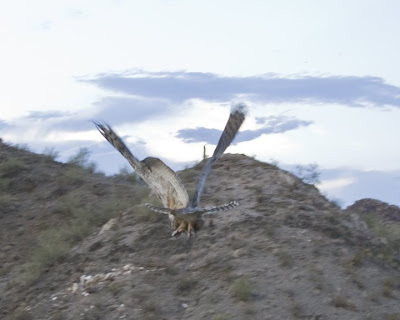 In a secluded area on a mountain preserve, two lucky individuals were privileged to assist in returning these magnificent nocturnal predators to the skies over Phoenix. As storm clouds and darkness approached, one of the ladies who was performing the release who was of Native American descent said a prayer for their new life: "Go to the earth, fly to the sun! Take care of your people, God's natural one!" I get chills every time I read the LW Blog ... what a great way to end the day. Thank you! !